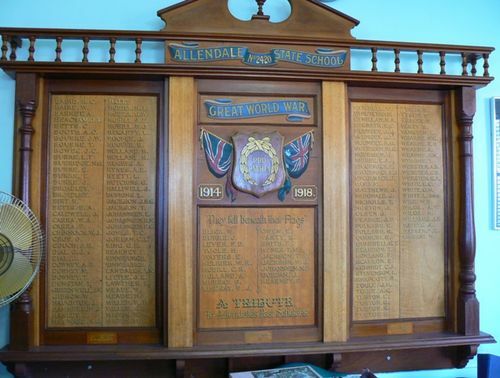 The Allendale State School was in Parkin Street, Allendale. The building still exists but it is a private residence. Seldom in the history of Allendale have such numbers of people been seen in the vicinity of the State school as assembled on Friday afternoon on the occasion of the unveiling of the honor board, erected by the citizens and the School Committee. The board which is of unique design, is made of Australian wood. Mr J. T. Sloan presided in the absence of Mr. H. Collins (President School Committee), who was indisposed, and apologised for Mr Collins. Addressing those present Mr Sloan briefly outlined the movement for the erection of the board and pointed out that the cost had been defrayed by the holding of entertainments. At present there was only a small amount about. £7 to be met, together with the cost that will be incurred in completing the list of names and in providing a register for the cabinet. Sir Alexander Peacock was accorded a great reception. He had apologised for the absence of Mr Joseph, M.H.R., who was unable to be present and also for Mr F. Tate, Director of Education, and Mr Hurley. He was proud and pleased to be present with Lady Peacock to do honor to the boys of the old town and the old school. He was more delighted to be present with them that afternoon to do honor to the men who had upheld the best traditions of the Empire. Generations as yet unborn would, when they gazed upon that board. honor the courage of those who fought for them and whom they were honoring that afternoon. (Applause). Cr David Anderson (President Creswick Shire) said he was pleased to be privileged to do honor to the boys and girls of Allendale who had fought on the fields of France. There were other boards being erected throughout the shire, all parts were trying to honor the boys worthily. He was sorry to see the old school so low in numbers, but believed that the district would revive. (Applause). The Chairman then asked Lady Peacock to unveil the honor board. In stepping forward she was accorded an enthusiastic reception. Lady Peacock said she was proud to be asked to unveil the board and to know that it had been made locally and of Australian woods from all the States of the Commonwealth. She knew they would be proud to have such a magnificent board in their midst to perpetuate the memory of their men. The audience then rose whilst Lady Peacock released the flag from the front of the board. The children and all present then sang the Recessional. Mr Cannon, head teacher, accepted the board on behalf of the Allendale State school and the children. He promised that it would be taken care of and handed down as a reminder for all time of the heroic deeds of the scholars who attended the schools of Allendale. The Ballarat Star (Vic), 21 April 1920.